attached is the chapter newsletter for April 2010. Hope you can take a few minutes to browse the April Newsletter. Don't forget to register for Smart Sustainable Reserve your seat TODAY! This work examines the corrosion behavior of reinforcing steel (RC) embedded in concrete mixes of various types by incorporating both Ordinary Portland Cement (Type I) and Sulfate-Resistance Portland Cement (Type V) and Blends with Fly Ash (PFA) or Slag (GGBS). The RC specimens were exposed to wet-dry cycles of chloride and/or sulfate solutions. Theory predicts that under such conditions the electrode potentials of the steel can suffer the formation of anode and cathode regions that depend on cement type and the local environment, so localized corrosion may occur. The final results in this book conclude that using two concrete types in the same structure will lead to the preferential formation of anode and cathode sites. Moreover, this has implications for the durability of real structures whereas the steel, either through design or repair, is embedded in more than one concrete mix type. Furthermore, the results showed that green concrete - containing either 30% Pozzolan or 70% Slag - had the best overall quality, durability and better performance than Portland cement concrete. This book will help professionals in Corrosion Control, Green Building and Sustainable Development. Dr. Mike Mulheron for his assistance, guidance and direct supervision, Dr. Tarek Muntaser for his valuable help, the Saudi Arabian Cultural Office for the academic and financial support, Dr. Omar S. B. Al-Amoudi at King Fahd University of Petroleum & Minerals, Dhahran, Saudi Arabia, for his thorough review of the manuscript, my friends and colleagues at Surrey University, for their cooperation and good memories. Sheikh Khalifa Bin Zayed, President of the UAE, and other leaders for their outstanding efforts and valuable support for the Green Building industry in their countries and worldwide. You are looking at the release details for "Corrosion Behavior and Durability of Various Cements and Pozzolans: The Effect of Cement Type and Pozzolan on the Corrosion Behavior and Durability Performance of Reinforced Concrete" in the Book category. NEW! Buying more than one different book? Oct 1, 2008 ... Dr Mohammed Alhaj Hussein ph: 1-813-333-9015 fax: +1-813-5085350 ... DR MOHAMMED ALHAJ HUSSEIN BOOK:The Effect of Cement Type and Pozzolan on the Corrosion Behavior and Durability Performance of Reinforced .... geometrical computations, and other objects of various sorts and kinds are concerned. 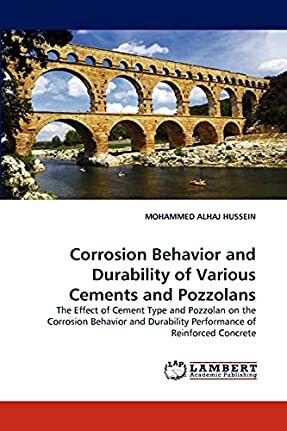 Corrosion Behavior and Durability of Various Cements and Pozzolans ALHAJ HUSSEIN. Autor: MOHAMMED ALHAJ HUSSEIN; Wydawnictwo: LAP Lambert Acad..